Flycasino.com News – Buffalo, New York – It’s rare to ever see a casino give up operating, but epic events result in epic (smart) decisions. 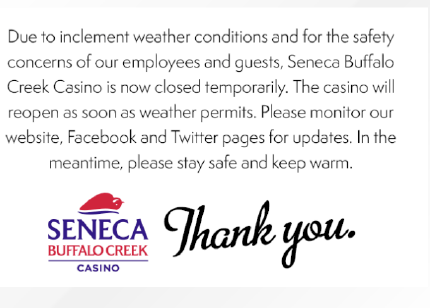 This epic snowstorm has shut down the Seneca Buffalo Creek Casino. Shovels and plows have been useless during one the fiercest “Lake Effect Snow” events to ever hit western New York. At last count, up to 8 feet of snow has fallen across the area and more is expected during the next three days. On Tuesday from 00:00GMT until 23:59 GMT, all members on their first deposit of $/£/€50 or more will receive a 250% deposit bonus up to 250.00.